Contact us by phone at 863-692-0906 (Eastern Time Zone) or by e-mail at birdsasart@att.net or @verizon.net. The att e-mail address is best from overseas. We gladly accept credit card orders by phone 8am till 7pm Eastern Time (8 am till 3pm Fridays). 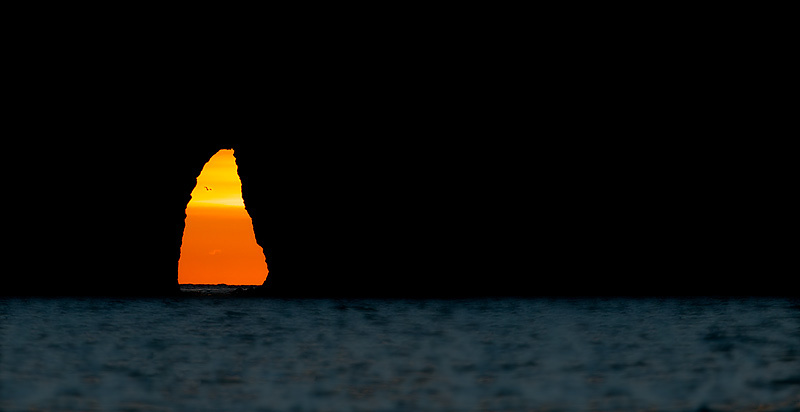 Photographic theme: my favorite images from my recent August trip to Bonaventure Island. Canon 400mm f/4 IS DO lens with the 2X II TC and the EOS-1D Mark III. ISO 400. Evaluative metering at zero: 1/640 sec. at f/10. Fill flash at zero with Better Beamer. Mongoose M3.5 on the Gitzo 3530 LS tripod with the Mongoose Integrated Flash Arm. Canon 24-105mm IS lens handheld at 105mm with the EOS-1D MIII. ISO 400. Evaluative metering + 2/3 stop: 1/1250 sec. at f/7.1 set manually. Canon 400mm f/4 IS DO lens handheld with the EOS-1D Mark III. ISO 400. Evaluative metering at zero: 1/1000 sec. at f/9. Canon 400mm f/4 IS DO lens handheld with the EOS-40D. ISO 640. Evaluative metering +1/3 stop: 1/400 sec. at f/7.1. On August 14, I flew from Orlando to Chicago (5 hour layover) to Montreal to Quebec City to Gaspe (the last two flights on the same plane). My flights were convoluted because I had decided to return to Bonaventure only weeks before. Monsieur Chris Dodds kindly picked me up at the airport and drove the 45 minutes back to our hotel in Perce, Quebec. My first day was a between-the-tours day (no 5 am Zodiac cruise), so we took the 8:45am boat across and made the 1.8 mile trek up the hill. I was disappointed to see that the nests atop the shelter had failed but this actually turned out to be a good thing as we learned that if chicks had hatched at those nests that the shelter would have been closed… There were hundreds of chicks around. Many of them, especially in the afternoons when it was hot, simply looked dead. Very dead. But the next morning they would be good to go. There was one chick right near the shelter that looked deader than dead. And filthy. We saw an adult at that nest that morning but thereafter it looked as if the big dirty chick had been abandoned. For three days it just lay there, totally covered in dirt and barely breathing. Then on the fourth and fifth days there was an adult at the nest and the chick looked very much alive (but still dirty). It sat up, begged, and got fed. There were some dead chicks of various sizes as would be expected, but the vast majority of chicks were thriving. Such is life at a rookery. That, and the lovely smell. And the constant racket of noise. On the morning of the 16th the entire group met at 5am for our first Zodiac cruise. It was a clear morning but the wind was from the west. We were in the middle of a group of diving gannets but they were coming in low right over our heads diving away from the light. I quickly assessed the impossibility of the situation; some of the birds were almost hitting us in the head. I grabbed the 70-200, mounted the flash, and began creating images of the backlit birds that hung just above our heads waiting to dive. I shared my thoughts and techniques with the group but as is common, nobody listened <smile>. After the cruise we headed up to the colony and were greeted with a mix of sun and clouds with the extended periods of cloudy weather that I greatly prefer for black and white birds. As I recall, our second Zodiac morning was weathered out, but on the third morning we struck gold, literally and figuratively. Bill Lloyd, a multiple IPT veteran who had come all the way from California, suggested that we work in closer to the cliffs to take advantage of the golden buff reflections of the cliffs. This turned out to be a brilliant suggestion as there were two other huge plusses: as the wind was again from the west, getting in tight to the cliffs got us into the calm lee of the tall cliffs, and once there, the wind direction changed constantly. For minutes at a time, we had perfect conditions with the gannets diving from our left or our right or even straight at us. I really enjoyed chatting with Paul Smith and hearing his stories of working in the deep mines of northern Ontario. And Paul turned out to be quite a fine photographer. Jackie Leader, a real sweetie and the wife of BPN accounting and legal adviser Paul Leader, was also with us. (Jackie had so, so much fun that she has stated that she intends to sign up for the first two trips next June!) Ken Cook and Ted Krug (who had been with Todd and me in Tanzania a few years back) rounded out the cast. 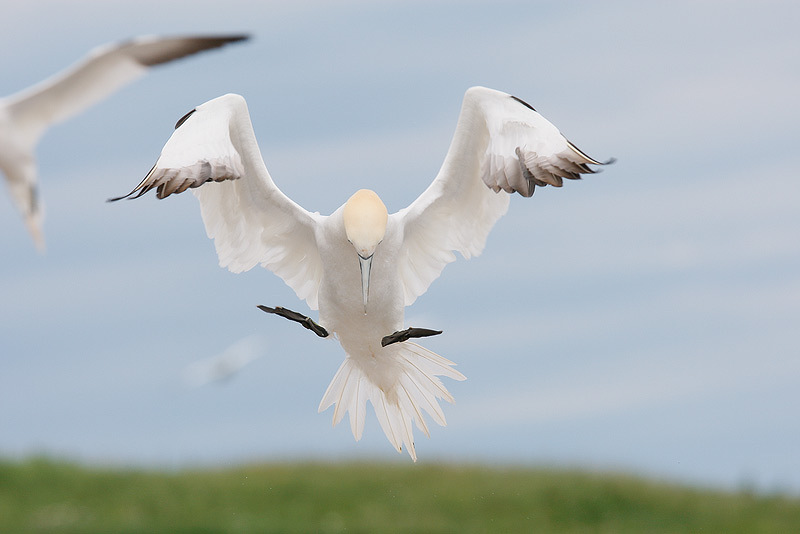 My four final days were a mix of sun and clouds, pretty much perfect for gannet photography. On my last afternoon in Gaspe I had the pleasure of meeting young photographer Matthew Barr, a sophomore at Yale University. Mathew was a very nice young man and as enthusiastic and passionate about nature photography as anyone I have ever met. Matthew joined Chris on the three Zodiac trips on the third Gannets Galore August trip. Canon 70-200mm f/4L IS lens handheld at 200mm with the EOS-1D MIII. Flash on camera fill at -1 stop. ISO 200. Evaluative metering +1 stop set manually: 1/250 sec. at f/5.6. Canon 70-200mm f/4 L IS lens handheld at 189mm with the EOS-40D. ISO 400. Evaluative metering +1 stop: 1/500 sec. at f/7.1. Flash on-camera fill at -1 stop. Canon 70-200mm f/4 L IS lens handheld at 121mm with the EOS-40D. ISO 400. Evaluative metering at zero: 1/1000 sec. at f/8. For those wishing to book back to back trips, Chris has generously offered a $200 discount on the cost of the second trip. Register with a spouse or a friend (double occupancy) and apply a $200 discount to each registration. Do consider joining Chris (or Chris and me on the last June trip) for the photographic experience of a lifetime. We fully expect all of the trips to fill in short order so if you are serious about joining us, please do not hesitate. You can find the complete details (including travel info and unsolicited testimonials) here: http://chrisdoddsphoto.com. You must contact Chris to register. To register try Chris at home at 1-450-827-1007 or on his cell: 1- 514-945-6195. Be sure to leave a message if there is no answer and follow that up with an e-mail to Chris at chris@chrisdoddsphoto.com. Registrations will be accepted on a first come/first served basis. The trips above offer an amazing value. They include three four-hour Zodiac photo-cruises in the early morning hours (weather permitting), breakfast and snacks with more than enough left over to make a healthy lunch, seven more hours of great photography at the colony, four nights lodging (at $145+/night), three return ferry trips ($25 per trip), and the park entrance fees ($3.50 per day). All in Canadian dollars. Now here is the amazing news: traveling all that way? Come a day early or stay an extra day—or both—and enjoy a day or two more on the island on your own. That will give you four or five days of great photography for roughly the cost of three. You will need to cover your extra hotel night or nights, your ferry rides, and your park fees for these days. Can you stand any more great news? Chris is bi-lingual and over the course of his 149 walks up and down the hill, he has crafted a wonderful relationship with the park staff. 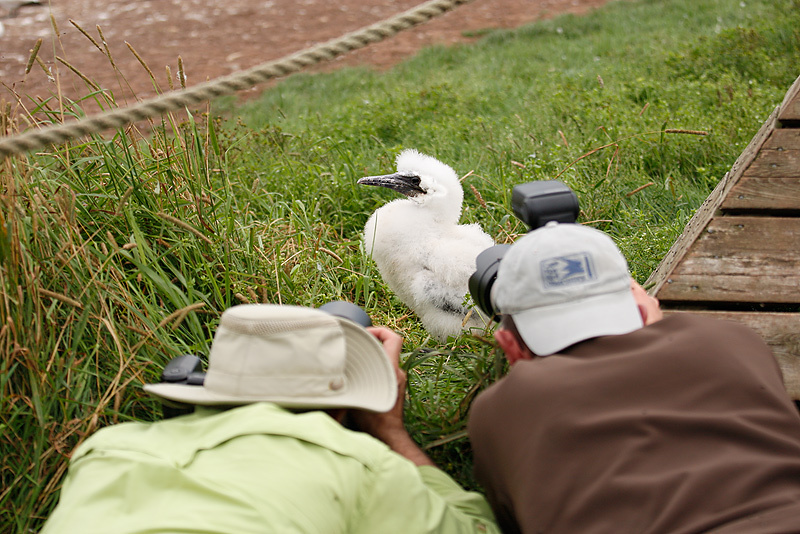 Oftentimes his groups are invited to photograph from areas not generally accessible to the visiting public. There are other perks that come with traveling with Chris that we are unable to mention here. Lastly Chris is an excellent photographer and a skilled teacher. 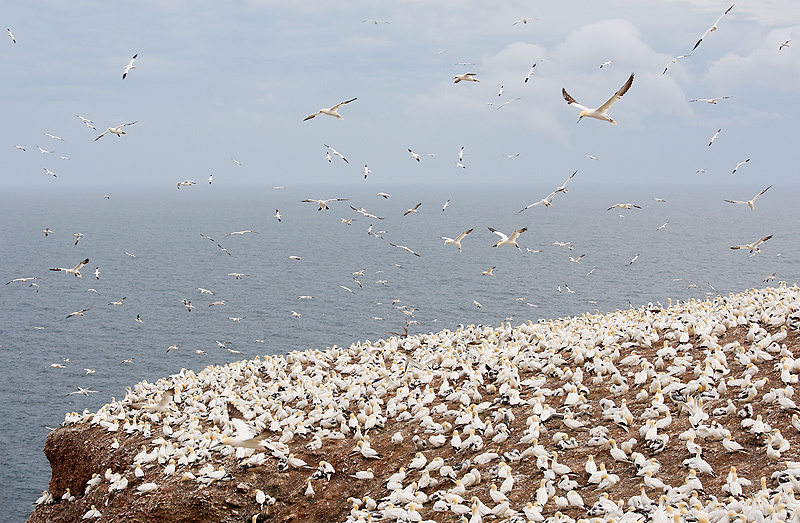 The Bonaventure Island gannetry is now the largest in the world, recently surpassing Bass Rock in Scotland from which the species part of the Latin name (Morus bassanus) is derived. 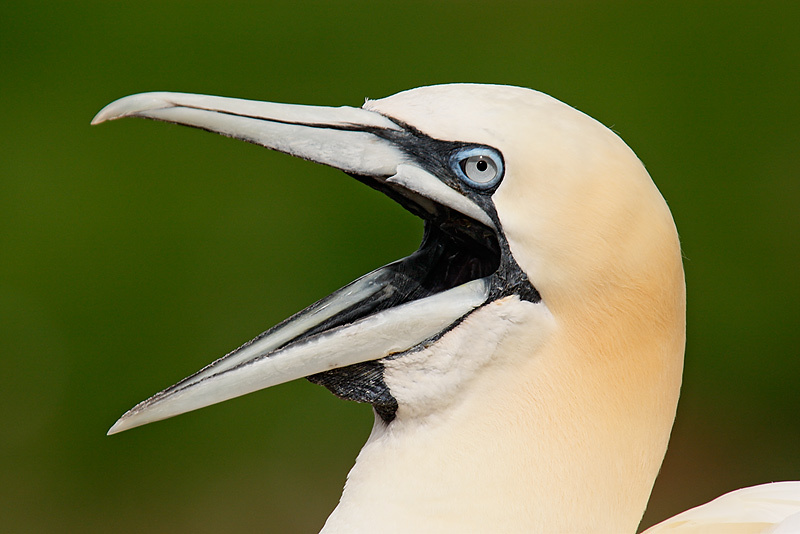 The genus name is obviously connected to my distant Scottish roots… There are generally more than 120,000 gannets at the colony. Flight photography is guaranteed non-stop. 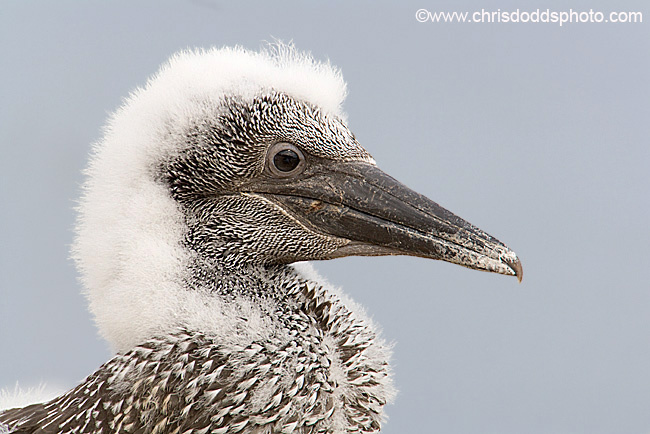 The birds will be cleaner and very active building nests and copulating in early June, while the later-on-in-June trips will offer similar opportunities plus a chance to photograph hatchlings. 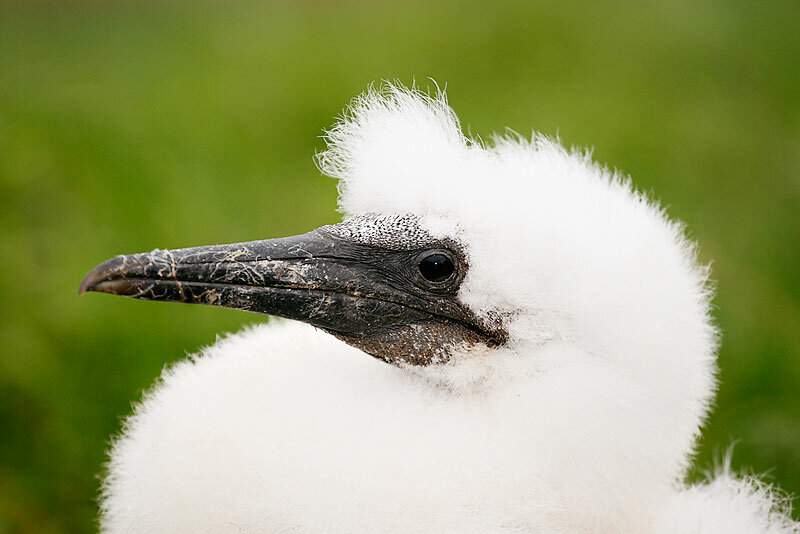 And the last June trip has me as co-leader; some may consider that a plus… Thousands of cute, fluffy, white chicks will be there during the August trip. 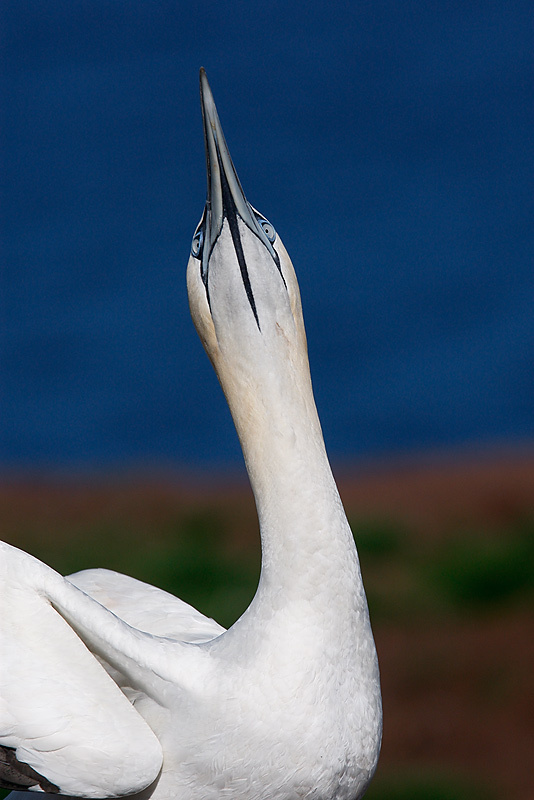 On all of the trips there will be gannet nests close enough to touch. You will learn many new techniques including flash flight in sunny or cloudy conditions, creating flash blurs, flash-as-main light techniques, and creating intentional blurs. And you will be doing flight photography until you can no longer raise your right arm. The weather-permitting Zodiac trips feature diving gannets, gannets in the water at close range, and a variety of other subjects including Great Black-backed and Herring Gulls, Black-legged Kittiwake, Common Murre, Razorbill, and Grey Seal among others. Aside from the gannets, nothing is ever guaranteed on these trips and the numbers of murres and Razorbills this year was far below normal. 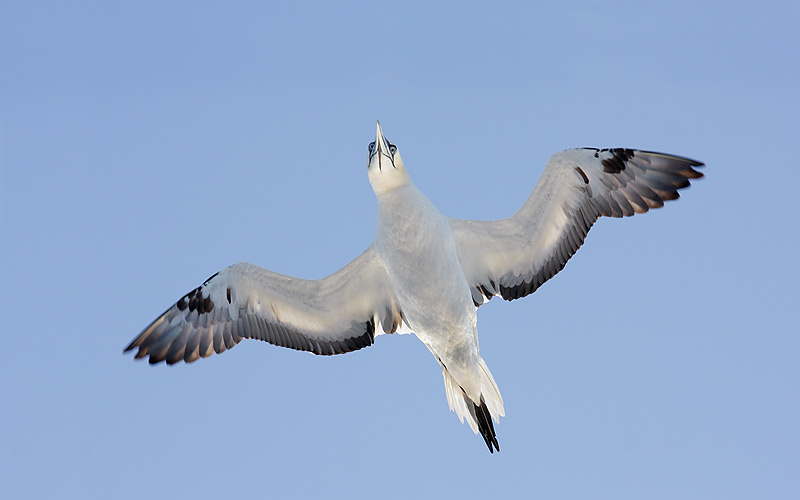 None-the-less, the gannet opportunities alone will make the Zodiac trips more than memorable, and you can never tell what might float by next year. On my first trip this past June, I was simply blown away by Bonaventure: http://www.birdsasart.com/bn264.htm. And as the images in this Bulletin reveal, I had a pretty swell time on my August trip. Did I mention that Chris is a genuinely nice guy and a selfless trip leader? Merci Monsieur Dodds pour mes deux grands 2008 Bonaventure voyages. This image was captured while demonstrating how to achieve sharp images with stacked teleconverters. I was on Bonaventure when this baby hatched in June, so it was fun to see how healthy it was. On very hot days many of the babies look quite dead - it's worth sticking around until late afternoon when they all get up and stretch. Artie’s comment: making images this sharp with stacked teleconverters requires super-human sharpness techniques, eh. 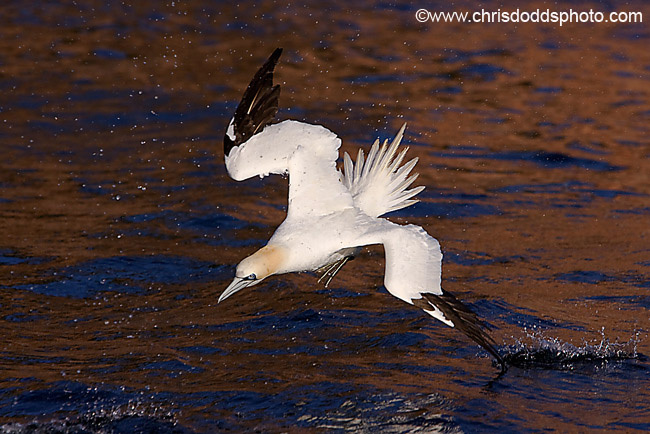 Northern Gannet Diving Bonaventure Island, QC, Image Copyright Christopher Dodds, All Rights Reserved. Canon 1DMKII, handheld 70-200 F2.8 and 1.4XII @ 250mm, Zodiac, mackerel. ISO 320 F8 1/1600s (full frame). This image was captured during a recent workshop that I co-lead with Monsieur Morris. It was one of those times when everything came together just right. And to think I thought I had the worst seat on the boat! I fly to Anchorage, AK on the morning of 2 August and then to Kodiak on 4 August to spend six days on the bear boat with 9 clients photographing coastal brown bears catching salmon. Then I take a red-eye flight to Dallas and continue on to Albuquerque and then down to Socorro where I meet the Volunteer Group. Jim Heupel, who just got back from a Todd Gustafson Kenya Safari, had to cancel as his dear wife Jackie broke her ankle on the fourth day and had surgery in Nairobi. Jackie, however, is a sweetie; they met up with the group and finished the safari. Best wishes to Jackie for a speedy recovery. I am sending love, strength, and energy her way. In any case, Bill Lloyd has graciously agreed to replace Jim at Bosque. Jim and Jennifer will be in the office every week day to help with mail orders and IPT and Portland Seminar registrations. I will be back in the office on 18 September so please hold your photo-related questions till then. Canon 70-200mm f/4 L IS lens handheld at 78mm with the EOS-1D MIII. ISO 400. Evaluative metering +1 stop: 1/500 sec. at f/9. 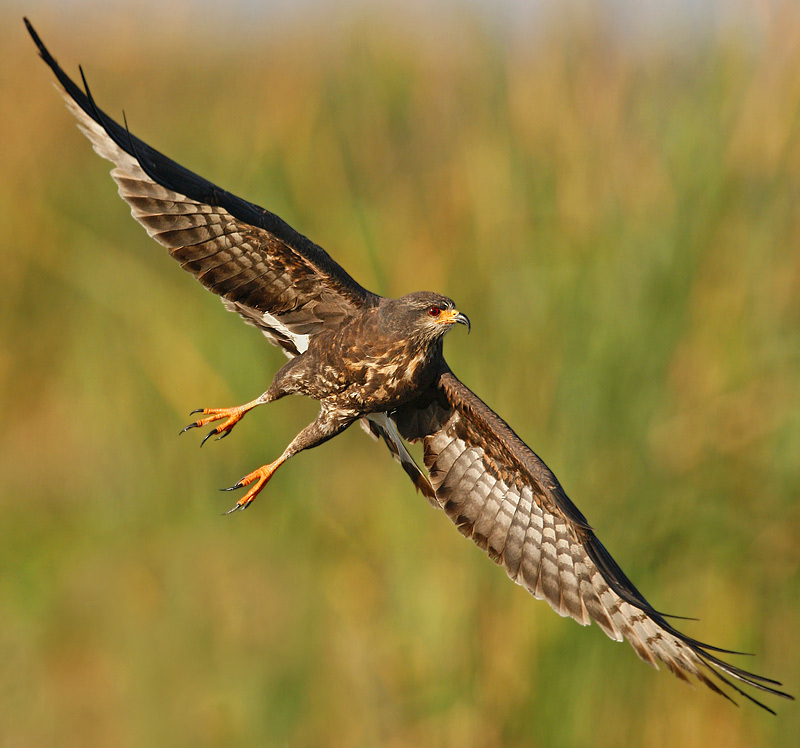 The six or eight day workshops will feature the unsurpassed avian opportunities of both central and west central Florida in peak season. Three or four days of learning and photography in central Florida with Jim Neiger and three or four days of learning and photography in west central Florida with James Shadle. This unique arrangement allows you to be exposed to widest range of subjects and habitats imaginable. The subjects and habitats are not the only thing that has a wide range. You will also be exposed to very qualified, yet different instructional styles. Come experience Florida at its very best! The main focus of these distinctive workshops will be solely on you. Class size is drastically reduced for maximum comfort and the individual attention provided will be without equal. Your needs will take center stage during this unique experience. 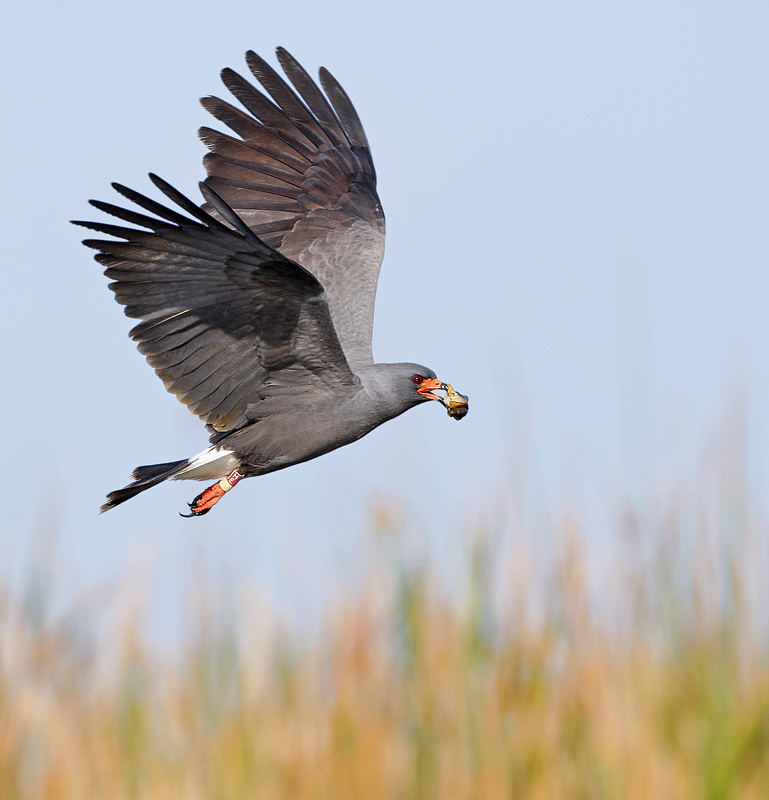 Artie’s comments: you have spent tons of money on equipment and you either live in Florida or are traveling to the Sunshine State to take advantage of our tame and beautiful birds. 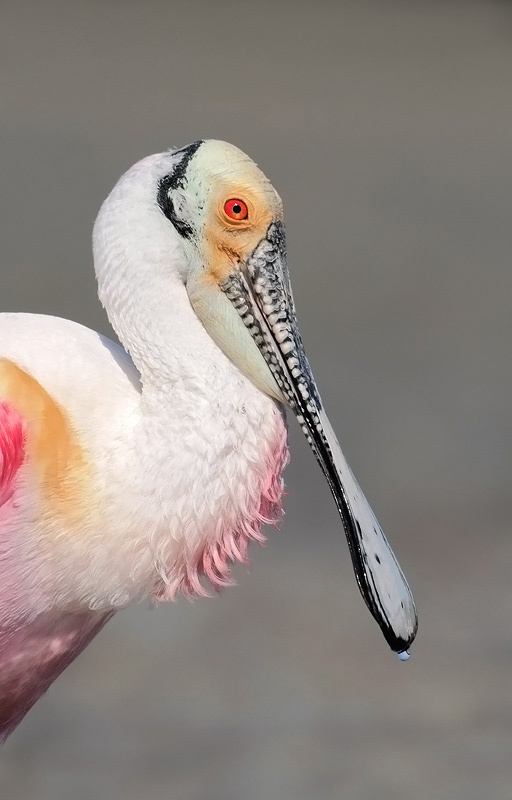 Roseate Spoonbill in breeding plumage and Snail Kite are two of our hardest-to-photograph species and are on everyone’s favorite subjects list. It is, therefore, foolish to come to Florida without making either a trip or two with both Jim N. and James, or better yet, signing up for one of their spectacular Best of Florida Workshops. Both Jim N and James schedule custom individual and small group trips. Please contact them for info. Jim N will be in Australia until October 27 but will have some internet access. 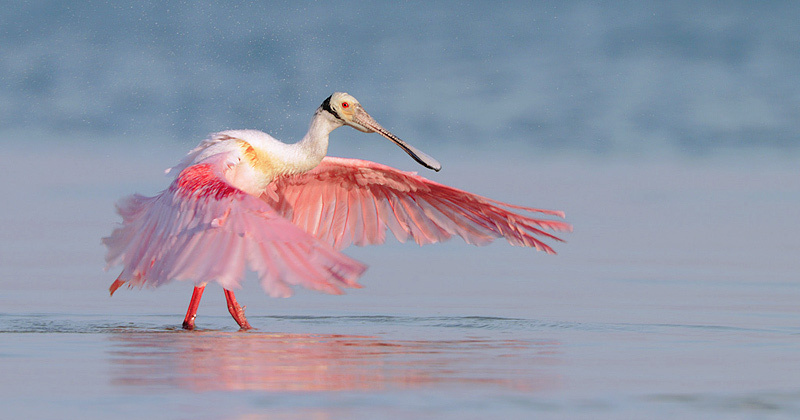 Roseate Spoonbill, Tampa Bay, Fl. 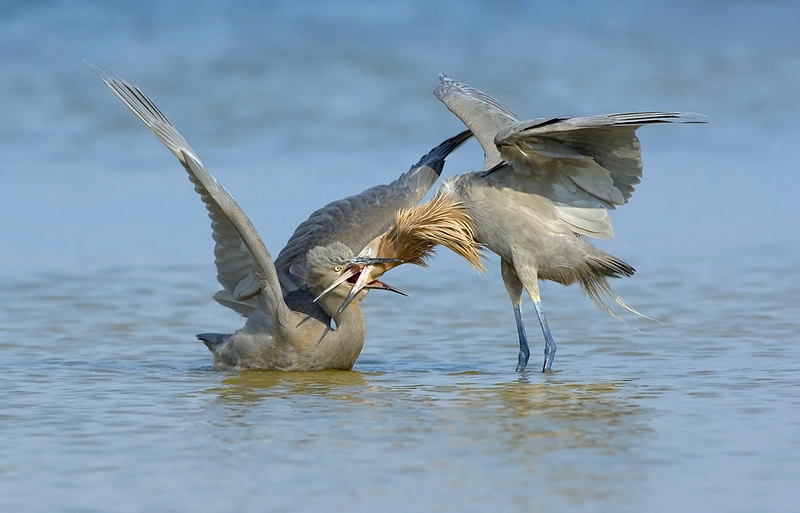 aboard the "Hooptie Deux"
Adult Reddish Egret feeding immature, Tampa Bay, Fl. aboard the "Hooptie Deux"
So whadda ya think of the quality of my JPEGs in this Bulletin? Pretty darned good, I imagine. On IPTs and on BPN, I am constantly amazed to see good photographers ruining their great images with poor image optimization skills. For those interested in learning advanced Quick Mask techniques including clipped wing and wingtip repairs and eye improvement techniques, Robert O’Toole’s masterful APTATS 1 (Advanced Photoshop Tips and Techniques Simplified) replete with detailed screen captures and carefully written tutorials will have you using Quick Masks on every image that you process just like I do. For APTATS 1 info click here: http://www.birdsasart.com/aptats.htm. Note: at the request of a Bulletin subscriber I have added approximate image optimization times to my images. These times do not include the minute or two that I spend on converting the RAW files. Canon 400mm f/4 IS DO lens handheld with the EOS-1D Mark III. ISO 400. Evaluative metering +1 stop off the water: 1/1000 sec. at f/7.1. No flash. This image required lots of Quick Mask work as you can see by looking at the original below. In addition to eliminating the bird on the left side of the frame, I moved the smaller bird in the background to a more pleasing-to-the-eye location. (Image optimization time: 12 minutes.) 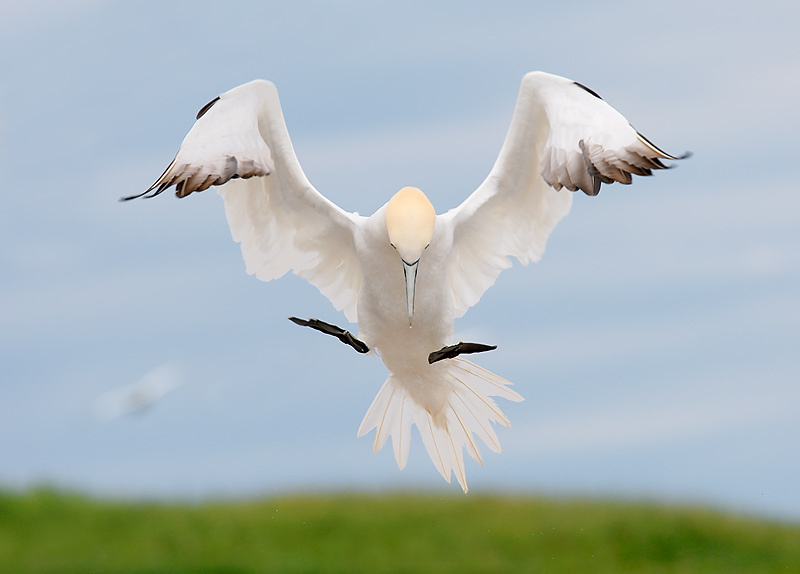 Do note that the original image showed a gannet landing with a strip of cliff along the bottom of the frame and a small bird in the background. 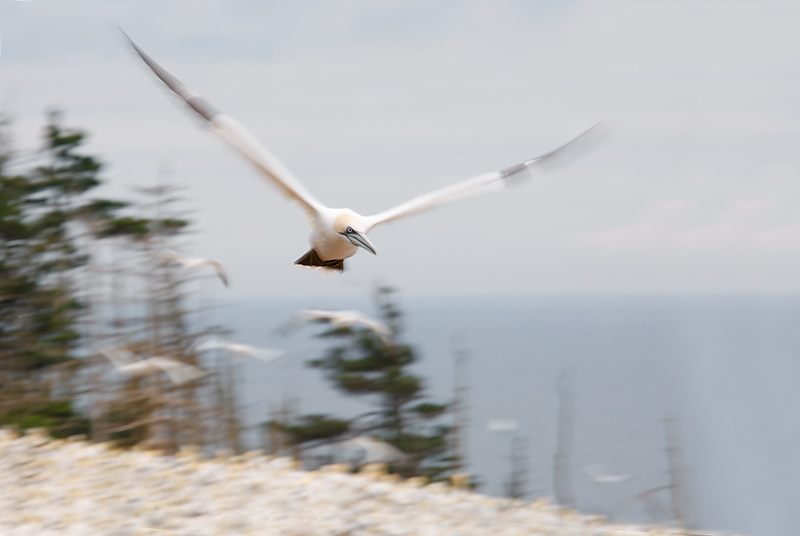 The optimized image shows a gannet landing with a strip of cliff along the bottom of the frame and a small bird in the background. Thus, as far as I am concerned, the natural history of the image remains unchanged. Our basic workflow includes detailed information on making the Shadow/Highlight, Levels, Hue-Saturation, Selective Color, and Curves Adjustments that are performed on most images. The basic BAA workflow is contained in both ABP II and Digital Basics. Canon 70-200mm f/4 L IS lens handheld at 192mm with the EOS-1D MIII. ISO 400. Evaluative metering +2/3 stop: 1/1000 sec. at f/4. On-camera flash as fill at -2 stops. With nearly 5,000 folks participating, many on a daily basis, BPN is thriving. There are so many great images of new species from all over the world posted each day in Avian Free and Wild that it is hard to keep up with them. and “Sharpness Problems When Hand-holding here: http://birdphotographers.net/forums/showthread.php?t=18369. 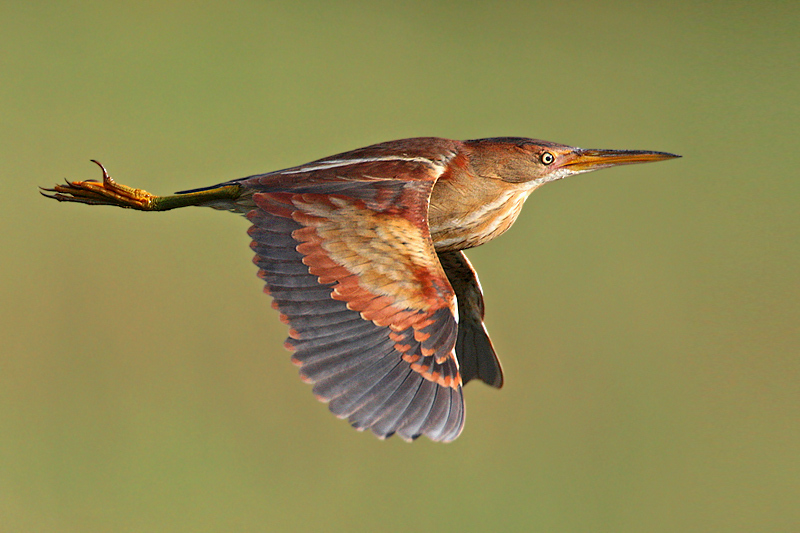 There have been some stunning images from our side of the pond as well in Avian Free & Wild. 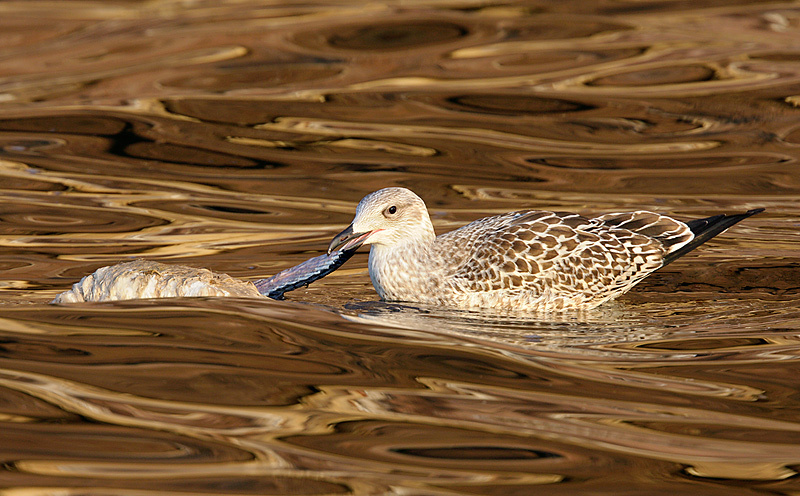 Check out Daniel Cadieux’s wonderful “Showing Some Blue” here: http://birdphotographers.net/forums/showthread.php?t=18605. Daniel will be a guest co-leader on the Southwest Florida President’s Day IPT this spring. Dan O’Leary’s lovely Juvi Wood Stork Flap” comes with some great color balance tips: http://birdphotographers.net/forums/showthread.php?t=18652. And Linda Robbin’s “Sword-billed Hummingbird at Flower” is a real stunner: http://birdphotographers.net/forums/showthread.php?t=18539. We should have copies of Linda’s CD Guide to High Speed Hummingbird flash available in about two weeks or less. It turned out to be a lot more involved project than either of us imagined. The amount of work that Linda has put into the guide boggles my mind. I join you in wishing Linda a complete and speedy recovery from her recent illness. 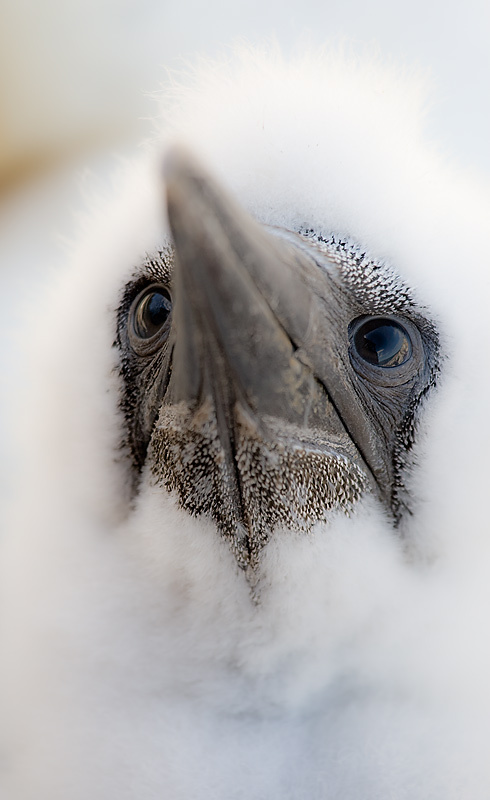 Lastly, many of my very favorite gannet images from the August trip are posted in Avian Free and Wild; because so many Bulletin subscribers are active on BPN I did not want to have too much duplication. You should be able to find them easily by clicking here: http://birdphotographers.net/forums/search.php?searchid=148145. Canon 400mm f/4 IS DO lens handheld with the EOS-1D Mark III. ISO 100. Evaluative metering +1 2/3 stops off the sky: 1/30 sec. at f/18 in Manual Mode. I created this intentional blur from the top level of the tower. By working at 1/30 second, I had hoped to achieve a fairly sharp eye (which I did) and to produce a pleasingly blurred background. Did that too! Seventy-one folks have registered for the seminar so far and we are hoping to double that number in the month before the seminar. While a good percentage of folks are coming from the surrounding states and Canadian provinces, we have folks coming from Florida, Maryland, Ohio, Minnesota, and—believe it or not Mr. Ripley—a mother and daughter coming from Hawaii. Mavis Aiu, who is originally from the area, wants her daughter to experience fall color. Oh, and we do have one photographer from Portland, Maine who registered! We have secured a ton of door prizes from most of the folks we do business with including Delkin, Wimberley, LensCoats, 4th Generation Design, and many more. It will be a truly great weekend filled with learning and fun. I would be thrilled to meet you there. The cost of the weekend seminar will be $169. The cost of either single day will be $99. Members of qualifying camera clubs are invited to apply a $10 discount. (If you are a member of a camera club or other photography organization please e-mail us before registering to learn how your group can become a qualifying club). Register with a friend or a spouse and take $10 off each registration. Register in groups of four or more and take $20 off of each registration. Register in a group of ten or more and take $30 off each registration. It is highly recommend that folks purchase the buffet luncheon option ($15/day includes tip and tax). Those purchasing the lunch option will receive their lunch coupon when they check in each morning.) The cost of the weekend seminar plus the two lunches is $199. 1- Send a check for the full amount made out to "Arthur Morris" to PO Box 7245, Indian Lake Estates, FL 33855. 2- Call us with a credit card at 863-692-0906. In all cases, we will need your e-mail address, your mailing address, and your daytime and evening phone numbers. Here is our Cancellation Policy: If for any reason you need to withdraw, please notify us ASAP. Once we receive your e-mail, your phone call, or written notice of your cancellation the following fees apply: cancel before July 10, 2008 and your fee will be refunded less a $20.00 cancellation fee; cancel by August 10, 2008 and your fee will be refunded less a $50.00 cancellation fee; cancel after September 10, 2008 and there will be no refund. Canon 400mm f/4 IS DO lens handheld with the EOS-1D MIII. ISO 800. Evaluative metering -2 2/3 stops: 1/3200 sec. at f/4. This image was made from the Zodiac shortly after we left the dock at 5am on a relatively clear morning. If you consider yourself a serious photographer and do not understand why it took 2 2/3rds stops of underexposure to get a proper exposure here, you will want to get yourself a copy of our reprint of the original “The Art of Bird Photography” when a boatload of them arrives here sometime in early to mid-October. (We sold all 80 available with the early delivery option.) The arrival of 246 more cartons of ABP will of course be announced via Bulletin; so you wanted to be a book publisher, huh? We are not currently accepting pre-orders. And remember, it ain’t just birds! Bosque IPT #1: NOV 22-25, 2008. Slide program on the evening of NOV 21. 4-DAY: $1799 Limit: 10/SOLD OUT. Co-leader: Robert O’Toole. Bosque IPT #2: NOV 29-DEC 2, 2008. Slide program on the evening of NOV 28. 4-DAY: $1799 Limit: 10/Openings: 1. Co-leader: Robert O’Toole. SW FLA POST X-MAS IPT: DEC 27-29 or 30, 2008. Slide program on the evening of DEC 26. 4-DAY: $1799 (3-DAY OPTION: $1349) Limit: 10/Openings: 4. Co-leaders: Robert O’Toole and Alfred & Fabiola Forns. SW FLA PRESIDENT'S DAY IPT: FEB 13-17, 2009. Slide program on the evening of FEB 12. 5-DAY: $2249 Limit: 10/Openings: 3. Co-leader: Robert O’Toole . COMING SOON: THE POST-NANPA 2 ½ DAY BOSQUE IPT. Please e-mail for advance details. And congratulations for reading this far down! Canon 400mm f/4 IS DO lens handheld with the EOS-40D. ISO 320. Evaluative metering +1 stop off the water: 1/1250 sec. at f/7.1. Fill flash at -1 stop with Better Beamer. Note: Arthur Morris has been a Canon contract photographer since 1996 and continues in that role today. Hunt's Photo of Boston, MA is a BAA sponsor as is Delkin Devices. Back issues of all BAA Bulletins can be found in the Bulletin Archives which may be accessed from the home page at www.birdsasart.com. To unsubscribe click here: unsubscribe.